Steve Austin is back and acclaimed film maker Kevin Smith unleashes his high octane vision in this new series from Dynamite. Featuring 28 pages of story/art in an action-packed first issue! 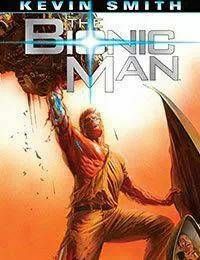 Kevin Smith is joined by Phil Hester, artist Jonathan Lau, and cover artist/character designer Alex Ross (the team who brought you The MAIN Green Hornet series), Smith unleashes Bionic Man into the 21st century as only he can.